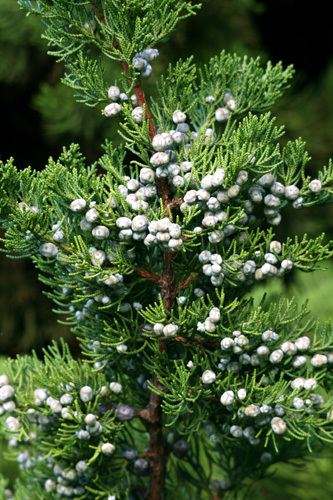 Juniperus chinensis. © Richie Steffen.www.greatplantpick.org (Accessed 7/2014). Juniperus chinensis is a evergreen conifer tree or shrub, to 20 m tall, 6 m wide, more often a shrub, to about 3 m tall, over 60 cultivars (including the widely spreading “Hetzii” often used for hedges); bark gray-brown, peeling in thin strips. Leaves gray-green, two kinds, adult leaves in 4 ranks of opposite pairs, scale-like, tightly appressed to twig, overlapping, about 0.1-0.2 cm long; juvenile leaves about 0.8 cm long, in whorls of 3, tips sharply pointed, spreading outward from twig. Flowers none. Cones with sexes on separate plants (dioecious), female cones ripening in two years, fleshy, turning brown, 0.8-1.2 cm long rounded. Habitat: Common horticultural plant rarely, if ever, escaping. Sometimes persistent in overgrown horticultural sites. Notes: Susceptible to bag worm (Thyridopteryx ephemeraeformis) (M. B. Gargiullo personal observation).